18 • August 2018 • S I G N & D I G I T A L G R A P H I C S ELECTRIC SIGNAGE Just like neon has given way to LEDs, other changes in front-lit channel letters have occurred. "These types of letters have gone through some changes over the years as to how the face is held in place," says Eppert. "Trim cap fasteners were the standard method for many years, in the late '90s fabricators began stencil-cutting the letter face leaving a lip (1/8-inch to 1/4-inch) and setting the acrylic behind the lip. This was a cleaner look than the trim cap and is still used today. The new- est method is to shoulder-rout the acrylic so it drops into the letter form, providing a retainer-less look." Back-lit (Reverse)—An alternative option to front-lit, back-lit channel let- ters offer a much different look. "Reverse back-lit letters provide a more elegant illumination. They frame the letter profile in light," Eppert says. "Depending on the distance that the let- ter is mounted off the substrate you can have a very tightly defined halo effect or a wider washing effect." For a company like Gemini that offers both front- and back-lit options, an emphasis is placed on the material choices for the fabricated letter. " 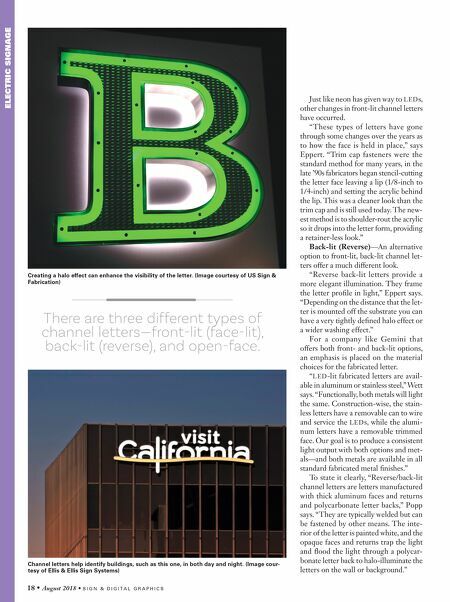 LED-lit fabricated letters are avail- able in aluminum or stainless steel," Wett says. "Functionally, both metals will light the same. Construction-wise, the stain- less letters have a removable can to wire and service the LEDs, while the alumi- num letters have a removable trimmed face. Our goal is to produce a consistent light output with both options and met- als—and both metals are available in all standard fabricated metal finishes." To state it clearly, "Reverse/back-lit channel letters are letters manufactured with thick aluminum faces and returns and polycarbonate letter backs," Popp says. "They are typically welded but can be fastened by other means. The inte- rior of the letter is painted white, and the opaque faces and returns trap the light and flood the light through a polycar- bonate letter back to halo-illuminate the letters on the wall or background." Creating a halo effect can enhance the visibility of the letter. (Image courtesy of US Sign & Fabrication) Channel letters help identify buildings, such as this one, in both day and night. (Image cour- tesy of Ellis & Ellis Sign Systems) There are three different types of channel letters—front-lit (face-lit), back-lit (reverse), and open-face.